Possibly the most famous case of Holmes, or maybe second after the Reichenbach Falls one, I decided now was the time to read it before seeing Ken Ludwig’s farce Baskerville, which is a hoot, by the way. Sticking pretty close to the book, there are only five actors doing every part in the book, plus a few extra. The humor in the play is extremely silly and not a part of the book, but there is enough of Doyle in there that you get a good idea of the book. The book is not so much a whodunnit as a how-to-prove-they-dunnit, but an entertaining read. Holmes and Watson are out when visited by a Dr. Mortimer. They engage in a small contest of deduction from the stick he leaves behind. Dr. Mortimer is worried by the strange death of his former friend and patient Sir Charles Baskerville, who was found dead in the yew walk near his home, his features so distorted as to be almost unrecognizable. He wants to consult Holmes on what the heir, Sir Henry, should do. Holmes, unable to leave London, sends Watson with Sir Henry and Dr. Mortimer to Devonshire with orders to write him in detail of all that happens. This Watson faithfully does, but it means quite a lot less Holmes than usual. I don’t have much to say about this. My major objection is addressed in the closing paragraphs, so at least I know that Doyle had considered it. I enjoyed the book. The pace and characters are good. At one point I thought Watson quite thick for following the course he did, but then something happened which I ought to have seen coming and didn’t, so I guess I shouldn’t point fingers. I have another objection to what the villain did in the end, but it’s mainly a quibble. Most of us can’t think clearly all the time. Overall, I highly recommend this if you enjoy mystery and Victorian fiction. This counts as a Crime Classic for Karen’s Back to the Classics Challenge, which I hope and believe I signed up for this year. This is also good for an animal in the title for Bev’s Just the Facts, Ma’am. I believe that what this has in common with Nine Times Nine is the attempt to make people believe something supernatural is taking place when really there are no hellhounds, family curses or immortals roaming the earth. This makes it the next book in my trail for Follow the Clues, also hosted by Bev. Well, I woke up at 6:30 with a bad headache so , I didn’t get up on time. It lasted most of the morning, sadly, but at least it is gone now and I’ve begun! Silver Spring, MD. Maybe one of these times I should go somewhere else. I have some nice cheese and crackers, some snack mix, cookies. I’ll play it by ear. I am going to try to make this readathon more like my first ones. I realized I’ve been too busy the past 3 years! to have a decent readathon report. Oh, I guess I just answered that. Read! I know everyone started without me, but I’m here now. Hour 5 has just begun. I wonder if I just figured out my commenting problem. I realized those blogs my comments disappear on insist on http:// when I supposedly fill in the url, but this blog is https://. Only thing I can think of! Just tried visiting http://www.literarylindsey.com/ but can’t post a comment. This happens A LOT. As soon as I finish this bagel, I should head away from the computer and maybe get more than 10 pages read. I didn’t read that much more than the first hour. Also didn’t move away from the computer. Maybe now? Haven’t left chair for any significant amount of time. I’m not a fast reader at the best of times, but somehow during a readathon I’m impossibly slow. I’m giving up on page counts cuz it’s too embarrassing. At some point in this hour I’ll be heading out for the evening. I’ve read (mumble mumble) pages and will take it up again when I return. I saw the movie decades ago. 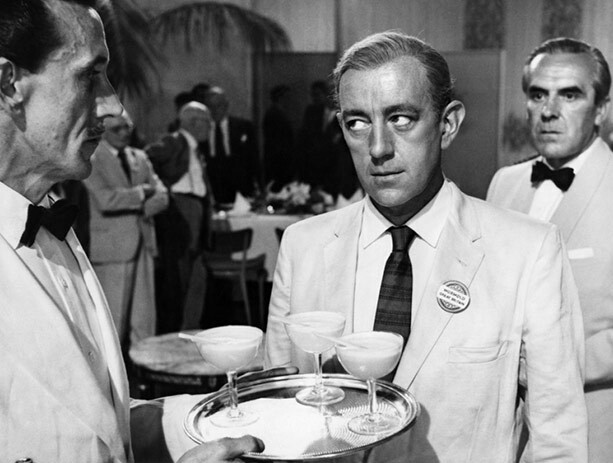 One of Alec Guinness’ great comedies from black and white days. I should see it again, don’t remember much. Okay, that was a little longer than I expected. We went out for a beer afterward, which was fun, but I was not reading. I’m going to go brush my teeth and get in my jammies and read as long as I can, which will probably be an hour. My days of staying up super late are behind me. If I wake up early (not a thing that happens often), I will try to read some more. To everyone going for the full 24 hours – go, you! You’re in the home stretch! You can do it! I couldn’t bring myself to read anything in the night when I woke. I did last until 2:00 in the morning. 1. Which hour was most daunting for you? 19th – 2 AM I remember being surprised it was 2:00, but I fell asleep shortly after. 3. Which books would you recommend to other Read-a-thoners? – Well, it’s a bit soon to recommend it or not, but generally I like Graham Greene. Most people seem to read graphic novels or YA and I’m not familiar with those. 4. What’s a really rad thing we could do during the next Read-a-thon that would make you smile? – Not helpful but I like it as it is. 5. How likely are you to participate in the Read-a-thon again? Would you be interested in volunteering to help organize and prep? – Very likely to read. I’ll have to think about organizing. Not my strong suit. Congrats to all who read! Thanks to all hosts and organizers! It’s always a fun time! Readathon crept up on me and leapt out of the bushes saying, “Hi! I’m this Saturday!” Oops. Um. So you are. I was aware in a vague way that April 28th was the day, but now it’s the 27th and I’m not at all prepared. What to read? What to snack on? I don’t know! And I can’t decide! I am thinking I might stretch it out a bit. Maybe read some this afternoon and Sunday. I never can read the whole 24 hours, so that would pad it out. It is supposed to rain, so that’s helpful. I usually like to start a new book and read that so as to associate each readathon with a particular read, but as I said, choosing one has been, so far, impossible. I will look around my shelves and Kindle and see if anything speaks to me particularly. This year they are trying to collectively read a million pages. Not sure how many people sign up for this now. It’s gotten a lot harder to tell since some tweet, some blog, some instagram, etc. But I always enjoy it even if I only end up reading a few hours. I will probably blog and tweet a bit. I’ve got a thing to do in the evening, so that will interrupt, but it is a Sherlock-based play so it’s sort of connected to books. So, I hope you’ll join in and read some tomorrow starting at 8:00 AM Eastern (It’s the same 24 hours for everyone so depending on where you live, it could start in the afternoon or middle of the night for you.) Get your favorite snacks, get some fun, or scary, or whatever you like books and read with people all around the world! I think the last time I finished a club book was 1924. Is that possible? I could scroll through my posts or the various club posts looking for me, but I’m not going to do that. I read Barbara Pym’s Quartet in Autumn. Miss Pym had had a long drought as far as being published went, when someone convinced someone that she could write and Quartet in Autumn was published leading to something of a renaissance for her late in life. Her books, as I mentioned, are often referred to as comic and funny. This is putting it a bit strong, I think. If I read them looking for laughs, I would be disappointed. There are some amusing moments, a few wry observations, but funny? Yeah, no. Not to me, at any rate. This doesn’t mean I don’t like her, I do. Why, I’m not entirely sure as very little happens, generally, though Quartet seems to me deeper and more thought-provoking than others I have read. The Quartet of the title are 4 English people who work in an office together. Two men and two women, all in their 60s, in the mid-seventies. What they do is never specified, but it seems to be unimportant, unfulfilling and not well remunerated. They are each alone now, though one is a widower, and each has a varying number of eccentricities. Letty probably has the fewest, she actually has a friend and is able to make some conversation. Norman doesn’t seem to have any except he’s frequently angry. Edwin goes to church a lot. Not just one church. Lots of churches. He goes from one to another going for the best saints days and other festivities. Marcia is the most eccentric. As prickly as Norman, she probably doesn’t converse much because this would interrupt her careful collecting of plastic bags and milk bottles. Pym books are very much slice of life. There isn’t really a plot so much as a series of events, some of greater importance than others, but all treated with care and a good deal of observation. This one was different in that it left me thinking quite a bit about the problems of aging (although in their 60s, they’re more like 70s today.) None of them has family they’re close to and only Letty has a friend. They occasionally make half-hearted attempts to connect with each other, but they also value their privacy so they never get close. There is nothing wrong with valuing your privacy or being eccentric as long as you’re not harming anyone. Marcia in retirement is pestered by a social worker who makes regular visits encouraging her to visit the local social center, take a holiday, eat something (the last of which she should have listened to.) It does seem like all four of them need something and maybe friendship would do it, but it is difficult to meet people once you leave school and even more difficult if you’re not very sociable. Part of what they need though is autonomy. At least, that seems to be part of the problem for Letty and Norman, both of whom seem to have felt second best most of their lives. Perhaps there needs to be some sort of social center for people who don’t like social centers. Don’t ask me how that would work. Like many books it offers more questions than answers. Should we reach out to people who are near even if we have nothing in common simply to have someone around? Like the song says, everybody needs two or three friends. Would their lives have been more fulfilled if they had crossed those barriers, or is that fulfillment only possible with good friends and not just people you hang around because they’re there? Marcia, in a way, seems more fulfilled categorizing her tinned food and plastic bags. We look at that and I suppose it means she’s failing to engage with real life. Maybe she needed psychiatric treatment. I don’t know what the answers are. Generally I would recommend Pym for people who like quiet, closely observed novels about people who are usually just a bit off somehow. Not quite fitting in. A bit lonely. A little short of the old joie de vivre. And quite a fair amount of social awkwardness. Maybe you’ll be one who finds them funny. Many thanks to Karen and Simon for hosting these! Having finished Dirk Gently’s Holistic Detective Agency, I just kept going with the sequel because there it was right in front of me. Such a shame he didn’t write more of them. This time our protagonist is a woman named Kate who is trying to join her boyfriend in Norway, though she doesn’t really want to go and suspects he won’t be there when she gets there. In front of her is a huge man with no ticket and no credit card also trying to fly to Norway. Kate, being the impulsive type and with her flight about to leave, offers to pay for the man’s ticket if he will send her the money later. This almost works when it emerges he has no passport either. Their plane takes off and a huge explosion destroys the ticket counter and a hunk of the airport. Kate wakes up in a hospital a day or two later shaken, but miraculously uninjured and starts to try to figure out what happened. Meanwhile, Dirk, who finally has a client with money, has just discovered this client had good reason to fear for his life. I don’t think I will tell you how these stories connect, nor what’s behind them, because I think it’s more fun not knowing. Adams is endlessly entertaining and you never know who or what will play a role from a passing eagle to Dirk’s strangely malevolent fridge. Adams’ writing is pure fun and so are his wildly improbable characters. I don’t know why this one’s never been turned into a movie. It would be a hoot. The only thing I remembered from this one was the I Ching calculator (I think I said zen before, but it’s I Ching.) A fun reread. Glad I did that. Now I’m joining the 1977 club reading Barbara Pym’s Quartet in Autumn. She’s frequently called a comic writer, though not by me. I don’t find her funny generally and this one seems sadder than usual. Probably because they’re aging and alone and I’ll talk more about that when I’m done. Thirty years ago when I wasn’t even born yet (<- total lie, I’m way older than that), Douglas Adams published Dirk Gently’s Holistic Detective Agency. Two years ago, BBC America made a series of the same title which I saw on Hulu because it only appeared on Netflix outside the US. (Why, Netflix, why??) I enjoyed the show, which is very strange and very violent, but a sort of cartoony violence which didn’t bother me too much. (The opening scene is a hotel room full of bodies and destruction, one of which was bitten in half by a shark (Landshark?).) I watched the whole first season which has an excellent cast featuring Dirk Gently, holistic detective, a corgi, an heiress acting like a dog, creepy apparently super-powered henchmen, the police, the FBI, the CIA, a kickass bodyguard, a holistic assassin, Todd Brotzman (played by Elijah Wood), the reluctant bellhop turned detective’s assistant and his sister and a van full of punk psychic vampires. As I watched, none of this seemed remotely familiar. I couldn’t remember much of the book, almost nothing, but I thought he was a bit more like a detective with a trench coat and a zen calculator. As for the story, no memories surfaced. I looked at the description of the book and it didn’t sound like the show, but I wanted to finish he show before rereading the book. So I did and I recommend it to people who like quirky science fiction stories. Then I read the book which I read 30 years ago and found Not As Funny as Hitchhiker’s Guide though mildly amusing. Upon rereading, my opinion is a whole lot warmer than that. It’s not really laugh out loud funny, but it is highly entertaining. Dirk doesn’t make an appearance until 100 pages in, First there’s a mysterious alien world with an electric monk that believes things for you so you don’t have to. This monk seems to have gone a bit peculiar and believes all sorts of odd things including that the valley he is in is a uniform shade of pink. He has a long-suffering and far more sensible horse who believes nothing of the kind, but the monk’s in charge. Later on there is a mysterious old professor at a college in Cambridge attending the annual Coleridge dinner with a former student named Richard. Dirk’s background is revealed, but the man himself doesn’t show up yet. Richard is a programer who works for a man named Gordon Way who will be murdered that night. These various elements will shortly merge into a story filled with Adams’ inimitable prose. I love the way he anthropomorphizes everything. Having finished it, I’d be prepared to swear I’d never read it before in my life. Nothing in the book was any more familiar than the show. Not that they had anything in common except about two sentences. The obvious one that both featured a holistic detective named Dirk Gently and that neither bothers with things like footprints or clues because of the interconnectedness of all things. That’s it. There’s an older series from 2012 which might be more like the books, but I haven’t seen it yet. In the book, Dirk is a sponging con artist. Richard accuses him of exploiting gullible old ladies by pretending to search for their cats. Dirk could probably make an excellent living as a psychic except he refuses to admit he has these powers. So, he scrapes along sponging pizzas off old friends and very occasionally doing something useful. The upshot is I enjoyed both the book and the show and recommend them to fans of this sort of thing. Already started the second book, but not sure I want to see the second season of the show enough to pay $25 for it. I hope it shows up somewhere for less.